"My husband, Randy, has perfected traditional sangria. I shared this tasty and potent summer cooler with my AR friends at MauiGirl's home, ergo, the title of the recipe. I hope that you enjoy it too. Be careful. This sangria can 'sneak up' on you!" In a 2-quart container, stir honey and triple sec together until honey has dissolved. 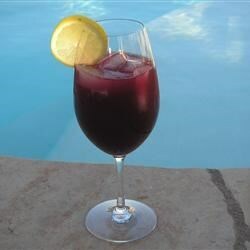 Mix in the orange juice, lemon juice, and lime juice, brandy, Cabernet Sauvignon wine, and sparkling water. Stir in the orange, lemon, and lime slices; adjust sweetness with more honey, if necessary, and serve in tall glasses over ice. We used good ingredients but the cabernet gave the drink a really harsh note no one liked. This is the best Sangria I have ever had. Thanks to Cathy and Randy for sharing. This was so delicious and refreshing! Perfect for a summer day! Thanks Cathy for sharing. I gotta tell you.. Love it! I normally do not like Sangria at all but I had two glasses of this lickity split! And yes, It does sneak up on you. I'm so happy the recipe is posted. Thank you!! I really enjoyed this sangria recipe. We like our sangria a bit more sweet, so I just added more honey to the pitcher. Thanks for sharing your husband's recipe, Cathy. It was yummy!